Boil one liter of water in a pot and add the chard. Let boil for only one to two minutes, or until completely cooked. Next, strain the cooked chard and press the leaves with a spoon or plate to squeeze out as much water as possible. Then transfer to a cutting board and chop the chard finely. Heat the olive oil in a skillet over medium heat and sauté the garlic and onion for three minutes, moving constantly. In a large bowl, combine the cooked vegetables with the chard. Season with salt, pepper and nutmeg to taste. 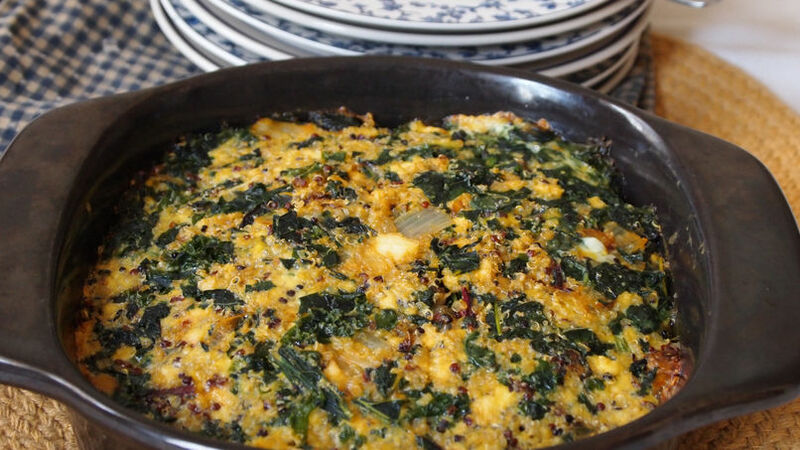 In another bowl, mix the cheeses, eggs and quinoa together. Cover the base of a 7 1/2 by 7 1/2-inch baking dish with small hand-ripped pieces of pita bread. Press down on the pieces to make a uniform base for the pie. Bake for 40 minutes, then remove from the oven and let rest over a cooling rack. Serve the pie cold or while still warm. Accompany each slice with a lemon wedge for squeezing when ready to eat. This pie can be made with just chard, a mix of spinach and chard, or with any other vegetable you would like to add. The base of this pie uses a simple piecrust, but you can also use any type of bread to form the base, including whole-wheat tortillas. You can also substitute the ricotta cheese for tofu. Just puré the tofu until creamy before using. Chard pie is a very traditional appetizer or starting dish in Peru - it’s one of those meals that becomes more delicious as it cools. Even though it’s a baked pie, it can be kept at room temperature or refrigerated, and later eaten without reheating. Dressed with a little lemon, this sabroso and wholesome dish is ideal for eating during the summer, as a lunch or light dinner. It can also be served as a mid-morning or mid-evening snack when hunger cravings attack. The original version of the chard pie recipe included brains, but today this preparation is no longer used very much. This version of quinoa pie uses the chard recipe for inspiration, but has several changes that make it new and unique. Adding other ingredients, such as mushrooms and zucchini, is one of the changes, while using quinoa-a very popular food as of late- is another. This pie will leave everyone happy and satisfied, while adding a great source of nutritional value to their daily diet.